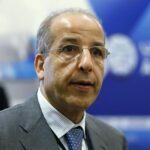 Saddek Omar Elkaber is the Governor of the Central Bank of Libya and Chairman of ABC International Bank plc, UK. Mr. Elkaber was the Deputy Chief Executive Officer of ABC International Bank Plc, and Chairman and General Manager of UMMA Bank, Libya. He has held past key positions in a number of banks and financial institutions including being the Deputy Chairman of the Board of Arab Banking CorporationAlgeria, Country Manager and CEO of Arab Banking Corporation-Tunisia and a Director of Arab Financial Services Company B.S.C. He joined the Board of Arab Banking Corporation (B.S.C.) in December 2011. He has more than 35 years of experience in international finance and banking.